Yep, it’s another geeky stats post trying to figure out “what’s going on with our traffic?” using two similar article-publishing sites to contrast and compare trends. Squidoo launched its “responsive” layout on Friday, December 7, 2012, hoping to cash in on the skyrocketing use of mobile devices to browse the web. Many of us had emailed HQ about the need to adapt to mobile/tablets over the past few years, so we certainly understood the reasons for the change, if not the timing. But the proof is in the pudding. 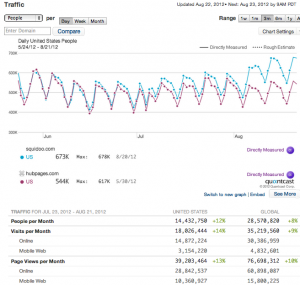 How did the Responsive Layout launch impact traffic? I’m kicking myself for not doing a screengrab of Quantcast’s traffic tracking before the changeover, showing what percentage of Squidoo visitors came in through mobile, but I’ve at least got that info from my own Google Analytics (see below). 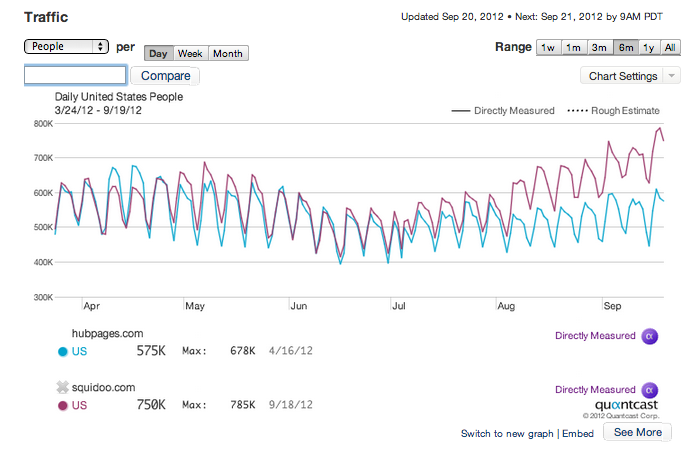 However, we can do a current comparison of Squidoo vs. Hubpages mobile traffic. 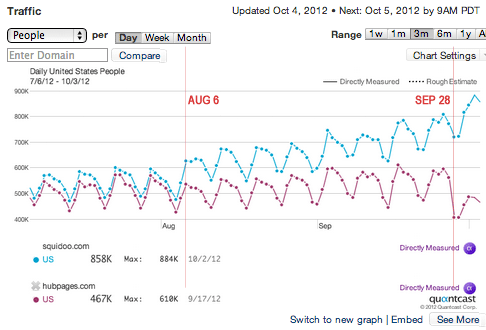 Squidoo traffic vs. Hubpages traffic, August 2012 through Feb 2013. 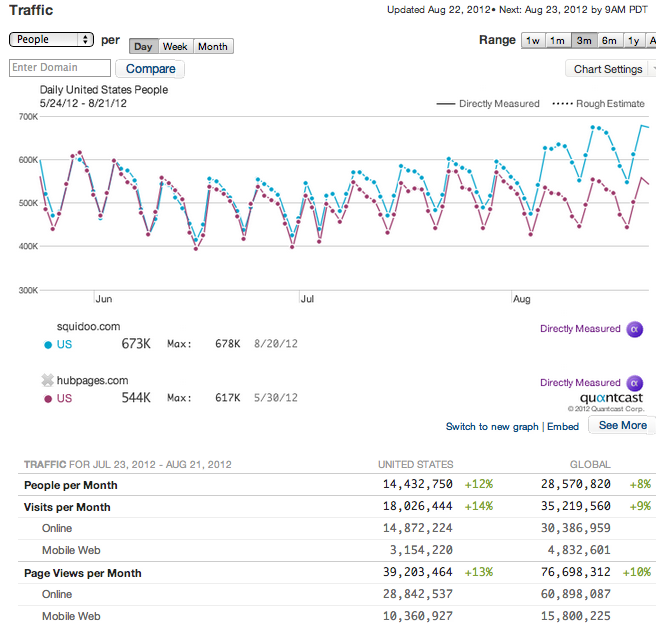 Has your traffic profile changed recently? The culprit may be Panda 3.2, confirmed on Jan 18, 2012. See that link on SearchEngineLand for more info. Google’s search algorithm ranks pages’ relevance to a given search query based on over 200 factors. For example, are the words in the search query (“what’s in a hot dog?”) found in the page’s headers, or does that page link to other good pages about that topic? The pages that rank highest on relevance get listed first for that query when someone searches for it on Google. 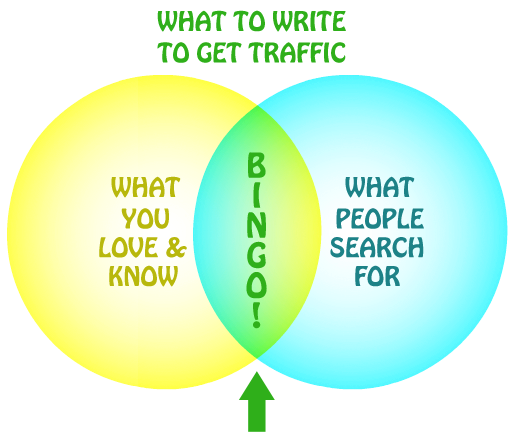 A better Google listing means more clicks, more visitors, more traffic. Starting last February, Google introduced a new factor, code named Panda. This factor is weighted more strongly than many other factors. 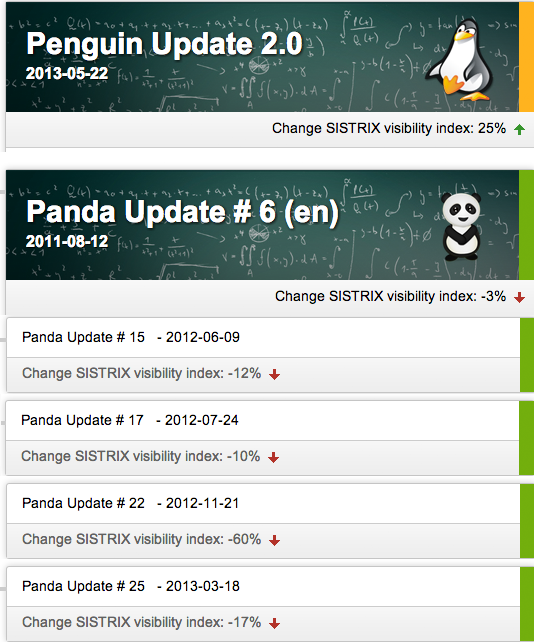 Panda is different from most of the factors in that it’s a measure of the domain where the page is found. Are there a lot of spammy pages on that domain (e.g. Squidoo.com)? Are there a lot of pages whose content is found elsewhere? Or is that domain full of unique, useful pages? Panda attempts to determine the overall quality of a website. It then boosts or detracts the raw rank of any page found on that site. Panda isn’t calculated every day. Instead, it’s recalculated manually whenever someone at Google says, “Time to run a Panda update again.” It then crawls all the sites on the web and re-evaluates whether they’re full of spam and junk or excellent content. The long and short of it: each time Panda is recalculated, ALL articles on Squidoo may be somewhat impacted, depending on whether Squidoo gets a good Panda rating or a poor one. A good one means that — other things being equal, a page on Squidoo will be listed higher in search results than the same page posted somewhere else. Or, if Squidoo gets downgraded, it’ll give lenses a slight disadvantage, like a golf handicap. 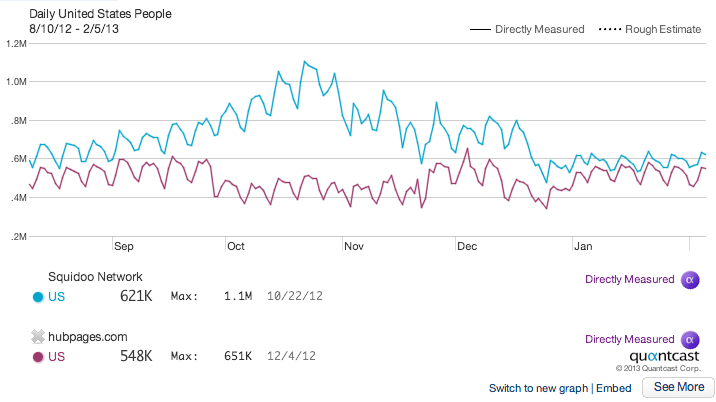 January 18ith is about the time my Squidoo traffic jumped by about 20%. However, I haven’t seen a lot of Squidoo members gloating over a sudden traffic jump, so this is evidently not much of a sidewide change — in which case, my own traffic boost is probably not due to Panda. There’s another Google update muddying the waters right now, making it difficult to tell which factor is causing what. Search Plus Your World now shows strongly personalized results in Google searches, including things your friends and circle have tweeted and shared. I’m not clear on whether Google has started giving more weight to socially shared links as a ranking factor— one of those 200+ factors mentioned above — or whether it’s still only regarding social signals from “trusted authorities” (say, a link posted by Neil Gaiman) as important and all the rest of our Tweets, Facebook Likes, etc as only significant to our friends. At any rate, any one of the recent reshufflings of what Google displays as seach results could explain my traffic boost. 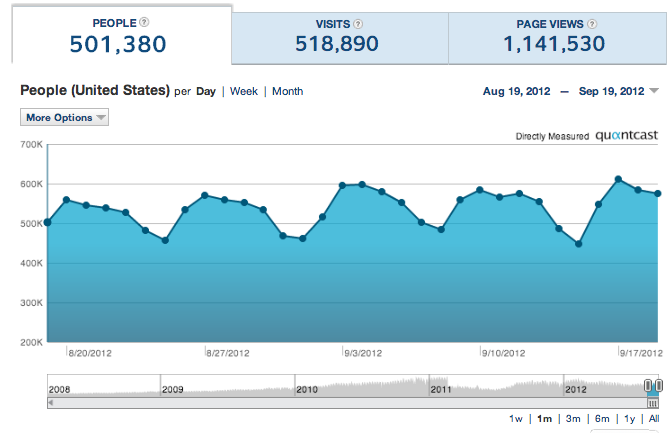 It’s not just more traffic following a holiday lull, as this is significantly more traffic than I saw in 2011.